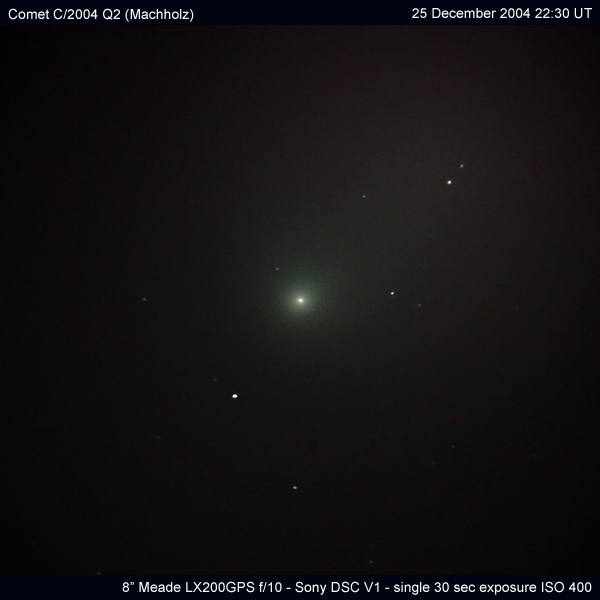 This is comet C/2004 Q2 (Machholz) at a distance of about 35 million miles from Earth on Christmas Day 2004. The visible cloud of light is the comet's wispy atmosphere or, as an astronomer would say, its "coma." With a diameter greater than 450,000 km, the coma is at least three times wider than Jupiter. Yet the comet itself is tiny. Comets are basically asteroids made of dusty dirty ice and this one is probably no more than a few miles wide, a miniscule nugget hidden deep inside its own atmosphere. Comets often have a green glow. This is due to the cyanogen (CN) and diatomic carbon (C2) contained in the comet's coma - these substances glow green when illuminated by sunlight.